When summer fruit season arrives, I buy fruit at the farmer’s market with the youthful enthusiasm of a 14-year-old girl let loose in a discount Abercrombie outlet with a limitless credit card. The only difference is that fruit rots a lot more quickly than clothes and can’t be handed down or CAN it? Last year, I started making strawberry jam with my overfull fruit basket. One batch was so good the jam almost helped @gregorytlee win his annual blintz-off with his Auntie Sharon. But I’ve only made jam in small batches that I refrigerate and use up in a week or two. Over the last year I’ve been lucky enough to meet two hugely talented food bloggers and published writers, Cathy Barrow of the blog Mrs. Wheelbarrow’s Kitchen and Marisa McClellan of the blog Food in Jars. Both of these ladies are also expert canners. In addition, I found out that a long time coworker and friend of mine is secretly a gold medal winning canner (more on that in an upcoming post). So I’m rethinking my fear of canning and potentially killing someone with the results. Apparently, it’s not rocket science (although there is science involved) and it would allow me to hand down, at least for a year, the overflow of my farmer’s market purchases. Recently, Cathy Barrow wrote this article in the NY Times and a blog post about the basics of canning. And Marisa McClellan just published a book on canning and preserving called Food In Jars (yeah Marisa!). The one thing Cathy listed in her equipment list that I didn’t have today, was time. 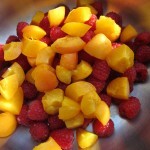 But I did have apricots and raspberries that needed to be used up and about one half hour. So in baby steps, I moved along the canning curve by practicing making jam worthy of giving away or feeding my own family. 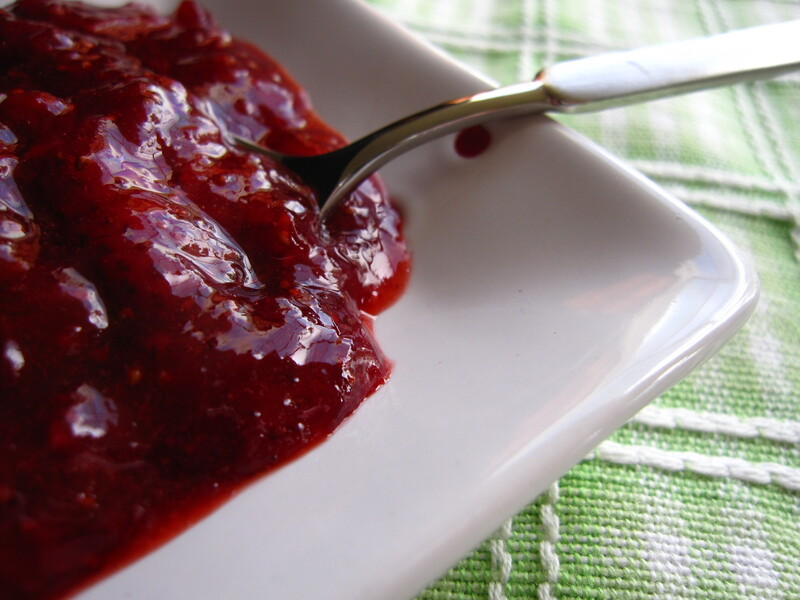 We recently bought a jar of Maman apricot raspberry preserves and it disappeared from the fridge in a flash. So I gave it a go with what I had in the house. 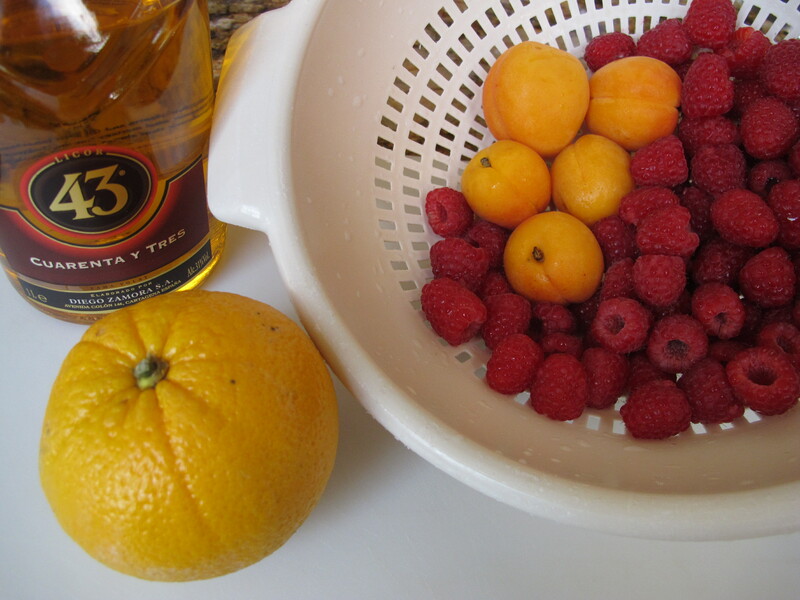 To the apricots and raspberries, I added some orange zest and a couple of tablespoons of a wonderful liqueur we discovered in Mexico called 43. It has citrusy and vanilla undertones which seemed like a lovely pairing with this jam. 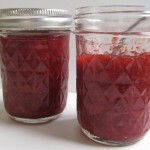 I also used less sugar than most recipes call for, but our family tends to like jam less sweet and as I tasted it, it seemed like just enough with the sweetness of the fruit. Combine the lemon juice and fruit in a heavy-bottomed saucepan and cook on medium heat for about 7 minutes while it breaks down and releases its juices. Once it is boiling and juicy, add the sugar and zest, turn down to medium-low and continue to boil and reduce for another 15 minutes or so. You’ll feel as you mix it that the liquid is reducing and you’ll see on the sides of the pan that the level goes down about 1 inch in volume (depends on the size of your pan of course). As you mix occasionally, skim off the white foam that appears. It’s done when it is visibly thicker and all the fruit is broken down. As it cools, it will thicken further. Transfer it to glass jars, let it cool a bit more, and then refrigerate. You’ll need to use it up in a week or two. I've read that you can freeze it as well. I've never tried it so I can't confirm or deny that this is a good option. If you are gutsy and talented enough to can it, it will last a lot longer! Do you can or preserve anything? If so, what and how did you learn your skills? Sharing your experience will help build my confidence so don’t be shy! soooooo yummy! I just made this, I added some honey and vanilla and it was so great. How did this come out texture-wise? I wanna make some thumbprint cookies using apricot-raspberry, but preserves, spread, and jelly are all too watery to use for that. Was it tight enough to use in something like that, or would you recommend adding some pectin? Hmmm – it’s been a while since I made it but it thickened up quite nicely. However, I haven’t made thumbprints with it, though the thought crossed my mind! I think if you cook it long enough reducing the liquid down, you’ll be ok. I never use pectin but I am far from an expert canner. 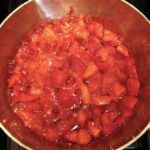 Here is an interesting page all about naturally occurring pectin (http://www.pickyourown.org/pectin.htm). It says raspberries have a high amount of naturally occurring pectin and apricots not so much. You can probably get away without the added pectin but if maybe a little dab wouldn’t hurt either just to be sure. Let me know what happens and how they come out. I love thumbprints! I *might* have to take this up. 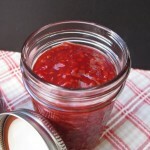 I’ve made freezer jam w/strawberries but would love to figure out using less sugar. 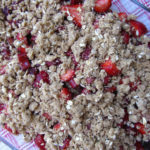 I am going to try this recipe as soon as I get some fresh blueberries from the farmer’s market – yum! Thank you for sharing. I actually might consider being a canner! Besides a little bit of equipment, the most important item is “time”. That’s the tough part for me. But how nice it would be to reap the benefits for months to come, instead of finishing it all up in a few days! I love homemade jams just for the fact that we can control the amount of sugar that goes into the process. 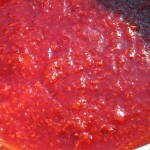 I just finished a sweet-spicy apricot chutney. I love that you have brought apricot-raspberry together. 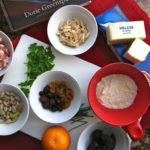 I have bookmarked this recipe. 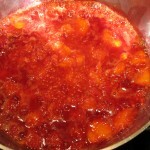 Oh a sweet spicy apricot chutney sounds lovely – I would love that recipe as well! And yes, controlling the sugar is one of the best reasons to make your own jam. It is so hard to find a jarred jam, even when you buy expensive ones, that isn’t over-sweet, at least for my family’s tastes. Try Try Try – so easy, really. I just have to get up the courage to do the canning/preserving part because trust me, they taste so good, you’ll want to make a larger batch and have some in the winter! This looks fantastic. Actually, both the blog and the jam look beautiful. That’s one of my favorite themes, and apricot IS my favorite jam. I am also in the less is more camp with respect to sugar, so it sounds perfect. 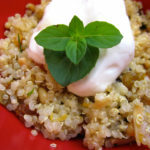 I hope you give it a try – so easy and really yummy. 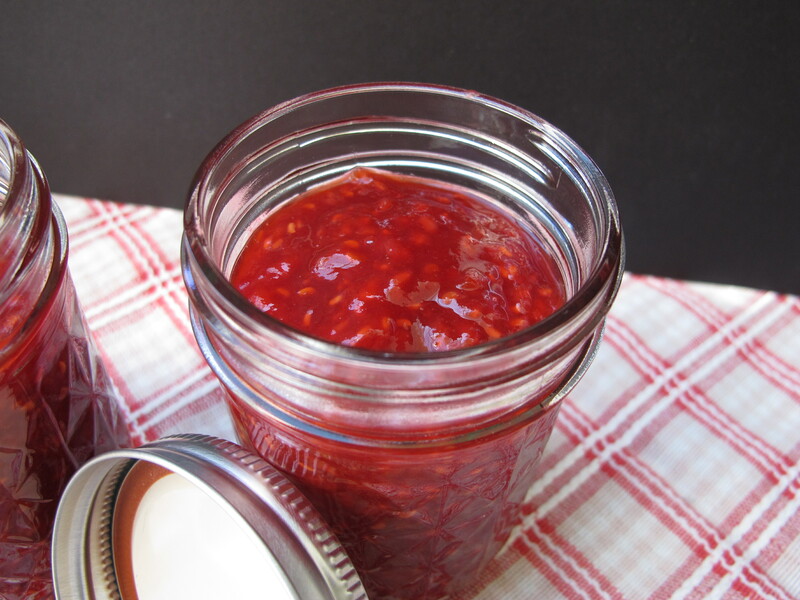 Thanks for stopping by and the lovely compliments on the jam and blog! Hope you’re having a great weekend. Yes, this jelled up wonderfully – I’m really happy with the consistency. And I didn’t have to peel the apricots – if they are thin-skinned, I learned from Cathy Barrow, you can just let them dissolve! now that you are also making jams whats next on the list? Wish I could get up enough enthusiasm to make some spaghetti sauce. BTW can you work magic with the market(stock market that is). What goes down, must come up (a new saying in our house). 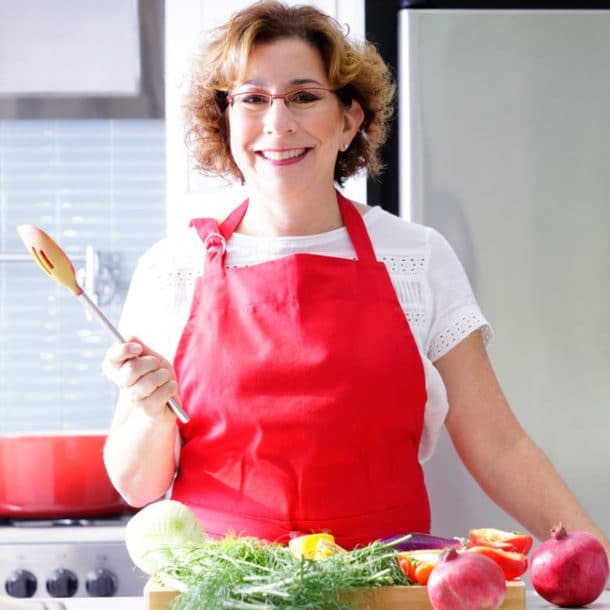 And keep cooking – it kept Grandma young didn’t it? YUM – mango chutney sounds excellent. Yay, Beth! That jam looks really good – the colors are vivid, and I bet the flavor is spectacular (being that apricots and raspberries are my favorite fruits:) I spent a lot of time last summer and fall preserving tons of fruit my dad brought from his “ranch”, and I am not afraid any more! It made me very proud to see all the jars lined up in the pantry, knowing that I did it! And I love both Cathy and Marissa! I think you also wrote a wonderful post to go along with that canning, if I remember correctly?! I did take another taste of the jam after it cooled to be sure it really is good and well, it does ROCK! Wish you were here, I’d bring you the extra jar! Well, I did everything but the canning but with a little more confidence and a lot more time, I think I can I think I can!